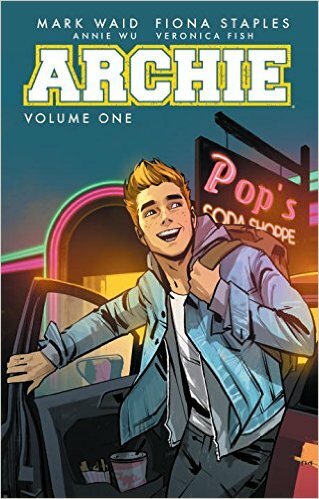 Graphic Novel Review 21/365: Archie – Pull List Week! Welcome to day one of Pull List Week! This week I will feature a good selection of books that are currently on my pull list. A pull list being the list of books that get pulled for you at your local comic book shop for you to go pick up. These are the titles that I read first when I pick up my pull list from the amazing Alternate Reality located on the corner of 111th and Kedzie in beautiful downtown Mt. Greenwood! I know more than a few people that claim that Archie has had a huge impact on them as a reader and as a fan of comics. For many, Archie is a huge part of their getting into comics story. But growing up, I was never a fan of Archie Comics. I didn’t have anything against them; I just didn’t have exposure, so I was not a fan. But in 2015, Archie Comics revamped the Riverdale Universe and put out a new Archie #1. With Mark Waid writing and Fiona Staples drawing, I was IN! The new Archie was stylized, colorful, and straight up funny, and it went on like that for a while, and in a lot of ways, it still is just as strong. I’m still reading it issue to issue. In fact, I just read issue 22 yesterday. And the title got me into reading Betty & Veronica; Jughead; and Josie and the Pussycats. But I must admit, I’m not caught up on all of them….oh, and I watched all of Riverdale Season One on the CW. Here’s my good and bad about this new Archie Riverdale Universe. I do like what Archie Comics is doing, and they have been cool in liking my Tweets about my digging the books and all, but I do have one small beef, then I’ll get to all of the good. Since the announcement of the Riverdale television show, Archie Comics has stepped up the cross-promotion in the back mater of the comics. Issue 21 and 22 had seven pages each dedicated to the CW show. Add that to the rest of the advertisements, each issue has about 12 pages of ads in the back. I guess that’s not much different than the ads clawing their way into Marvel or DC books, but I never used to notice it in the Archie books; I do now. What happened to the older Archie stories that used to be in the back of those comics? I didn’t really care for those either, since they were taking me away from the new Archie story-line, but at least it wasn’t 7 pages of CW plugs. I have not read the trades, but I’m willing to bet that they are not as bad with the ads (most trades are not). And with a few Archie trades currently out, that’s where I’d start if I were new to the Archie Universe. Like I said, the art, story, and humor of at least the first two trades are fantastic! This run of Archie is one that I cannot keep on my classroom racks. Once a few kids get into it, they all want in. 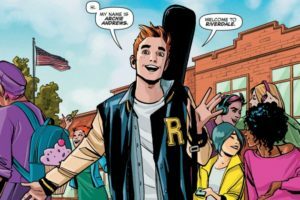 Yeah, it’s primarily white, middle-to-upper-class, teenage problems, but you can’t help but love Archie: he breaks the fourth wall, he’s charming, and he’s modest. Try not to like Archie over the first 12 issues. I dare you! What am I using this book to teach? Nothing. This is poolside fun. This series is best-selling candy that just gets kids wanting to read more stuff like it, and if a book gets kids excited about reading, it’s fine with me! And while some of the people working on the book have changed over the years, it’s been, for the most part, consistent. The last few issues have taken a darker turn, and I’m still not sure how I feel about Cheryl Blossom becoming a starring character in the book just as the CW show started, but I’m still reading, and I don’t plan on stopping anytime soon. It’s kind of like having a great friend that at times pisses you off, but they are too fun to stop hanging out with. Get it? If you were an old fan that has not returned or someone that has never been a fan, you need to grab the first trade or two of Archie and check it out. Share it. Get people reading more single issues comics that are not just superhero books. If you are looking for some current comics to add to your own pull list, make sure you follow my graphic novel reviews this week for the new hotness.